Ontario, located in east-central Canada, is home to nearly 40 percent of the country’s population as well as its largest city, Toronto. But Ontario is a huge province with plenty of room for hunters to roam its woods and fields in search of thriving populations of deer and black bears, as well as moose and elk. Black bears are one of Ontario’s major attractions for nonresident hunters. Bears can be hunted in both spring and fall in most management units, and are usually hunted over bait. The spring bear hunt was closed for a number of years but was recently reopened to help control the large numbers of bears. Ontario also has excellent deer hunting, with an estimated 400,000 white-tailed deer in the province. Good deer hunting can be found in most regions of the province. Moose hunting has also traditionally been and important part of the Ontario hunting scene. In recent years moose populations have declined to about 90,000 animals, which is still a significant number. The best moose hunting is generally in the more remote areas of the province. Ontario also a small population of elk, but the season is restricted to Ontario resident hunters only. Upland game, including ruffed grouse and spruce grouse; turkeys; and waterfowl round out the varied hunting opportunities in Ontario. 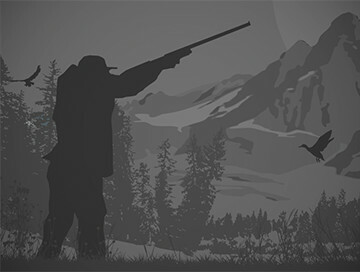 Learn more about the rules and regulations for hunting in Ontario at https://www.ontario.ca/page/hunting. The hunt includes 6 days and 7 nights. Up to 12 people per hunting party. Separate room available for female hunters! Licenses can be purchased here in town at "Albert's"
$300 Canadian/person/day. 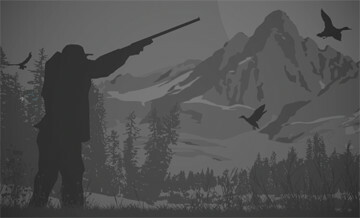 For this hunt we have numerous properties that we have been scouting all year. You'll be hunting out of tree stands or ground blinds. Enjoy a week away from home with one of our affordable combo hunts for grouse and small game as well as some world class fishing. These combo hunts are available from Mid-September through Mid-December and include your cabin, boat, motor, gas, and some great fall Ontario fishing and hunting opportunities for other small game such as Rabbit.